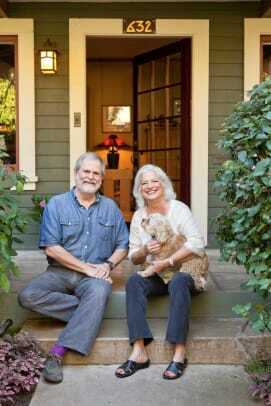 With a good eye, this couple made a tiny Santa Barbara bungalow a thing of beauty. Comfortable, complementary furnishings include a pair of Morris-style chairs and a Mica Lamp Co. table lamp on a Limbert-style table. Boulevards lined with palm trees are populated with bungalows and Spanish Revival homes in neighborhoods with scenic views stretching from the Santa Ynez Mountains to the Pacific; year-round temperatures are in the 70s. It’s easy to see why Santa Barbara is so popular, and why housing is in demand. 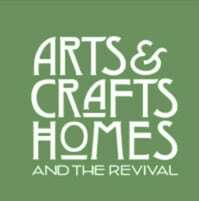 When Steve Dowty and Dee Duncan were looking for a home near the city’s historic downtown, Steve, an architect, knew that anything affordable would require renovation. He wasn’t discouraged when they found a 1300-square-foot house in the historic Bungalow Haven District. 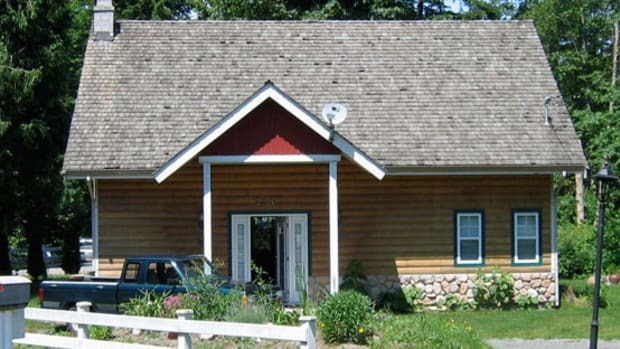 Built circa 1920, its bones were good and he could see past problems he called “cosmetic”: Texcote sprayed over redwood siding; fir trim inside slathered in layers of blue and white glossy paint; oak floors hidden under green shag carpeting. Broad, overhanging eaves frame the portico. Nevertheless, the original layout had never been altered. Rooms were open, filled with light from exceptionally large windows. The original sandstone fireplace in the living room was intact, and cracked plaster ceilings were easily repaired. A generous backyard had space for extensive gardens, and even offered vistas towards the Pacific and the Channel Islands. 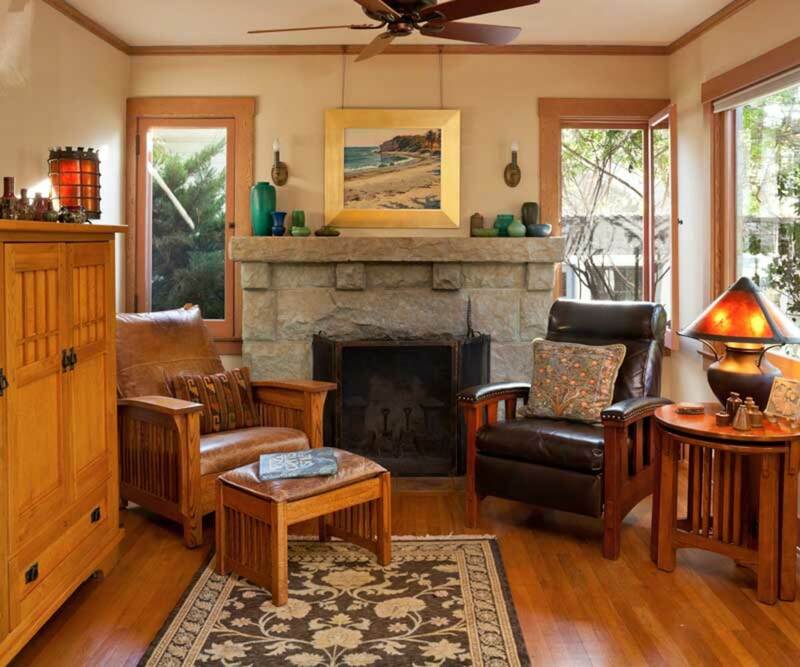 A substantial sandstone fireplace centers the western end of the living room. The couple’s mix of vintage and new Arts & Crafts furnishings include a custom Stickley reproduction settle, leather-covered Morris-style chairs, and a comfortable Stickley rocker. Above the mantel, a California plein air painting in a gilded oak frame adds a luminescent glow. 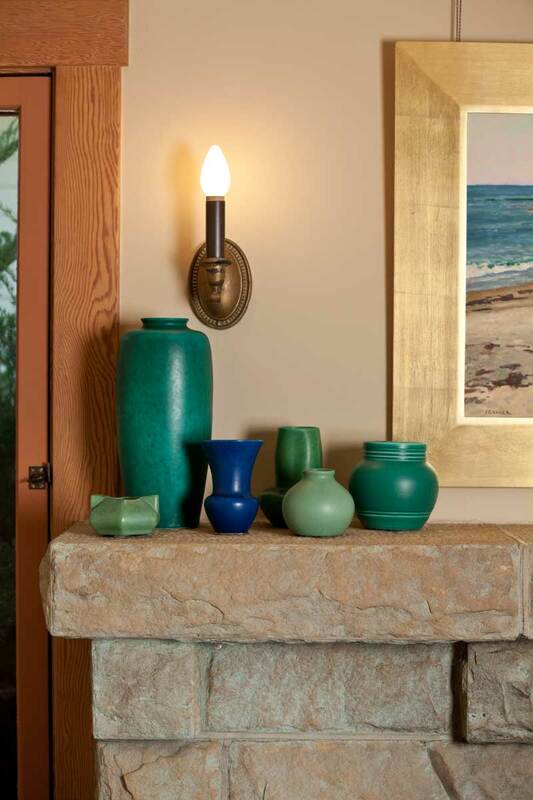 The sandstone mantel shelf holds Arts & Crafts pots; the Colonial Revival brass wall sconce is original. The oil is by John Comer, a member of The Oak Group (contemporary Santa Barbara artists). Steve Dowty began collecting pottery when a neighbor gave him a ca. 1910 Grand Feu vase by L. A. potter Cornelius Brauckman. 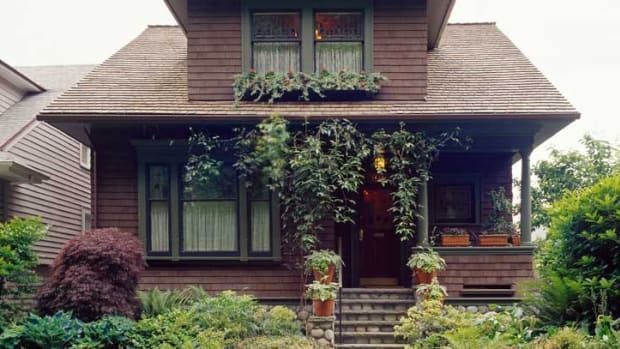 His interest piqued, he began acquiring Arts & Crafts ceramics including Rookwood, Niloak, and Weller, along with pots by British makers including Ault, Bretby, and Martin Brothers. Before long, richly hued vases, jugs, candlesticks, and bowls crowded cabinets and tabletops throughout the house. 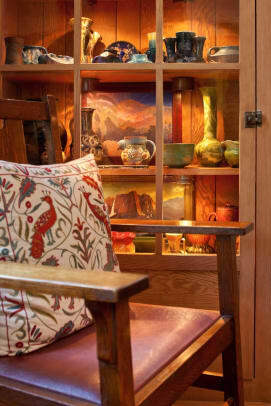 At the center of the house, the spacious dining room boasts a sparkling, leaded-glass, built-in china hutch on the south wall, which holds more of Steve’s extensive pottery collection. The focus is on a Stickley Director’s oak dining table and comfortable, Gustav V-backed dining chairs upholstered in butterscotch leather, all from Warren Hile Studio. A substantial chandelier from Arroyo Craftsman glows above. Under the window, a handsome Prairie-style desk is the perfect spot to catch up on while gazing at the banana and citrus trees in the garden. 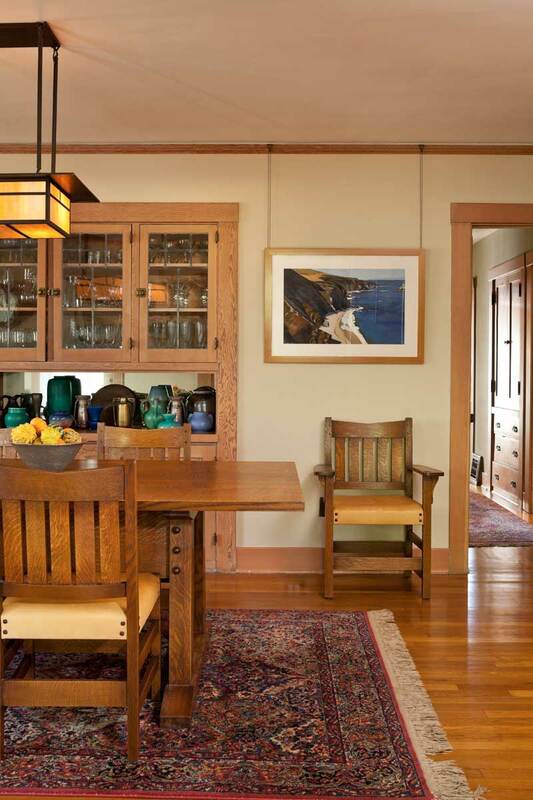 The dining room is centered on a Stickley-design oak table from Hile Studio, Inc. The backyard has been terraced into two levels separated by a low, sandstone-and-brick wall, and planted with fruit trees, with a small pond and stream in the center. Mabel, a Plymouth Bard Rock hen, and Martha, a New Hampshire Red, settled in as permanent residents and are much appreciated by homeowners and neighbors for their daily production of one egg each. Every inch counts in the small room. New upper cabinets, built to match the original fir base cabinets, add much-needed storage space. 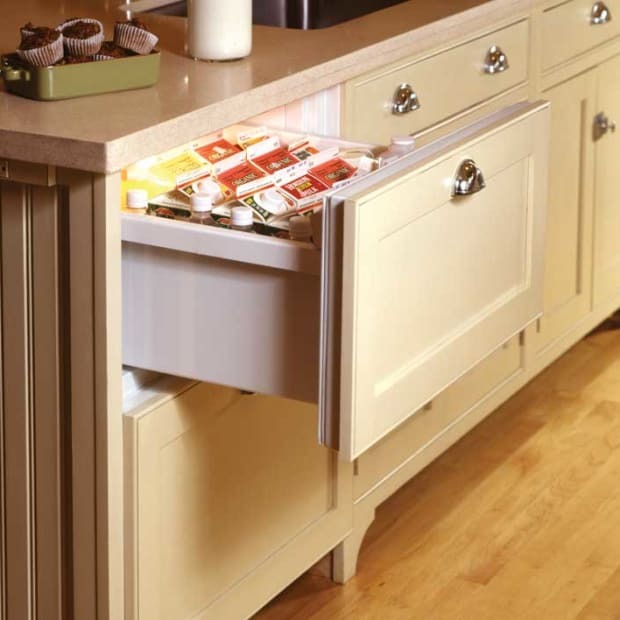 Dishwasher drawers are concealed within cabinets. Above the wainscot, walls are painted in cozy, warm ‘Hubbard Squash’ from Sherwin-Williams. An adjacent butler’s pantry became a cheerful breakfast room, its walls painted Sherwin-Williams ‘Indian White’—a warm buff color. The breakfast room opens to the dining room. The bathroom had been remodeled by the previous owner, who installed a generous casement window. Steve and Dee added Arts & Crafts period details: a one-inch hex tile floor, subway-tiled walls, and period-style fixtures including a pedestal sink and a diminutive clawfoot tub tucked beneath the window. Simple, modest, and filled with light, the bungalow is now a comfortable family home that celebrates craftsmanship and art. 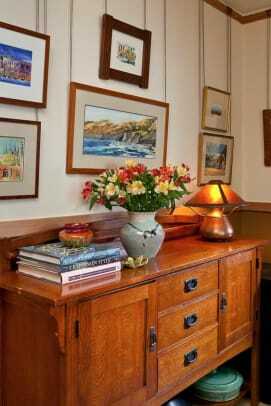 Bretby and Linthorpe pieces are clustered atop a Greene and Greene-style cabinet in the living room. Homeowner and collector Steve Dowty says that British pottery complements the vintage American pieces in his displays. Three of his favorites are Martin Brothers, Bretby, and Ault. Martin Brothers (1877–1923) The four Martin brothers were famous for their eccentric, often grotesquely modeled figurines—such as their “Wally Birds”—and for wheel-thrown ceramics. They specialized in a distinctive type of salt-glazed stoneware with an orange-peel texture reminiscent of work in the Middle Ages. Bretby Art Pottery (1883–1933) Founded by Henry Tooth and William Ault, Bretby produced both inexpensive pressed pottery, often figural animals and birds, and more costly thrown wares. 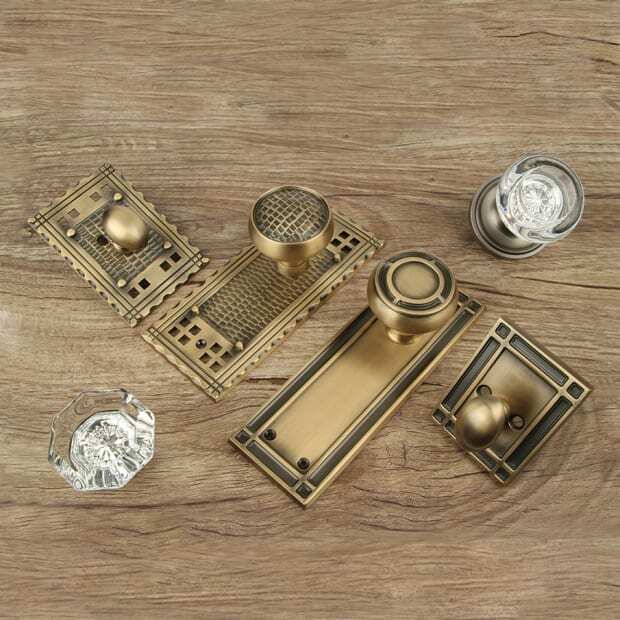 Innovative finishes imitating bronze, copper, steel (and also wood) are a Bretby trademark. Ault Pottery (1887–1923) William Ault left Bretby in 1887 to run his own pottery with his daughter Clarissa. 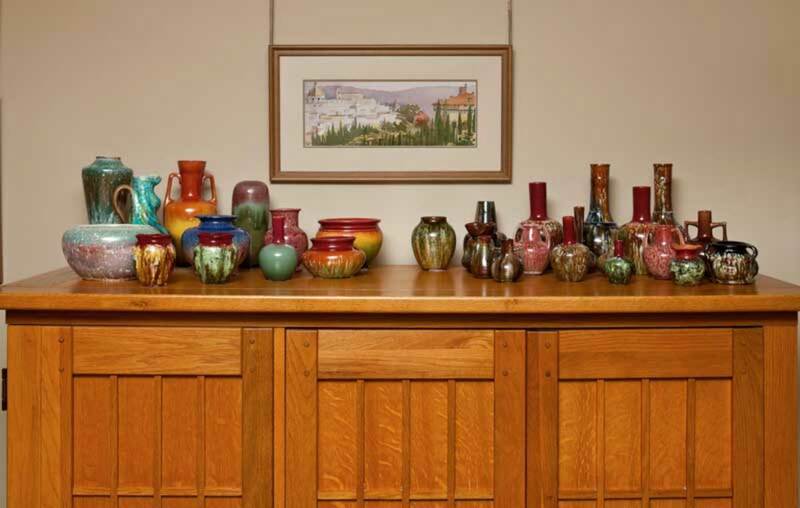 He was known for colorful glazes in turquoise and yellow; Christopher Dresser designed for him in the 1890s, producing forms, such as his egg vases, that still look modern. Their house isn’t big, even with an upstairs rear addition. 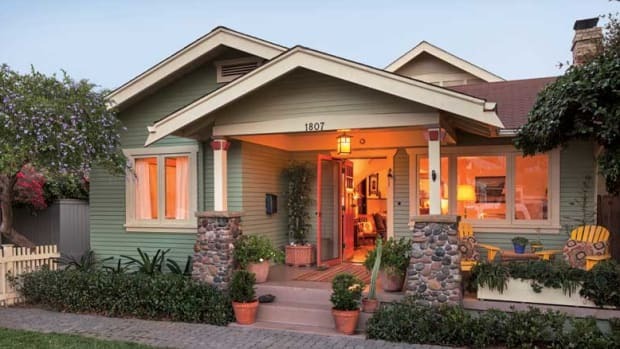 But with a pleasing plan and period details, it has been a charming bungalow home. 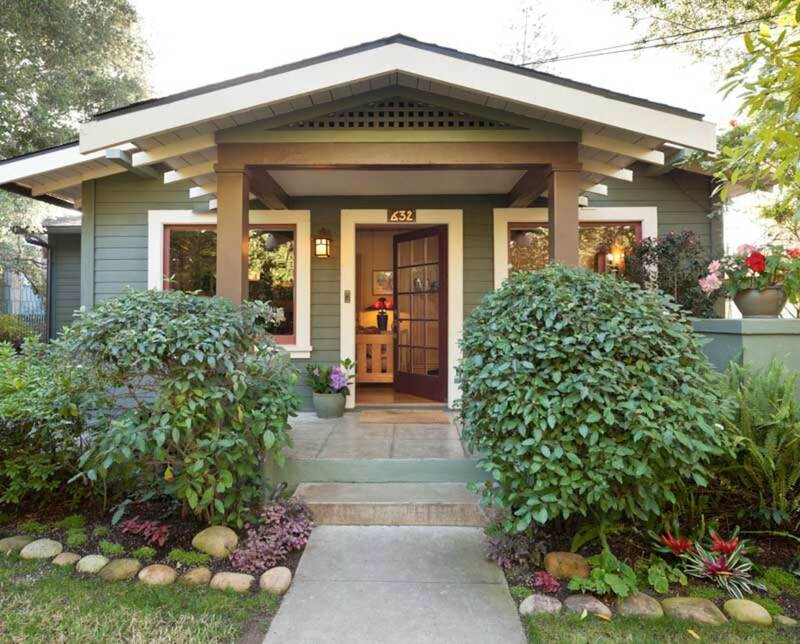 Not the typical Craftsman house, this transitional bungalow has elements of Victorian Shingle Style. 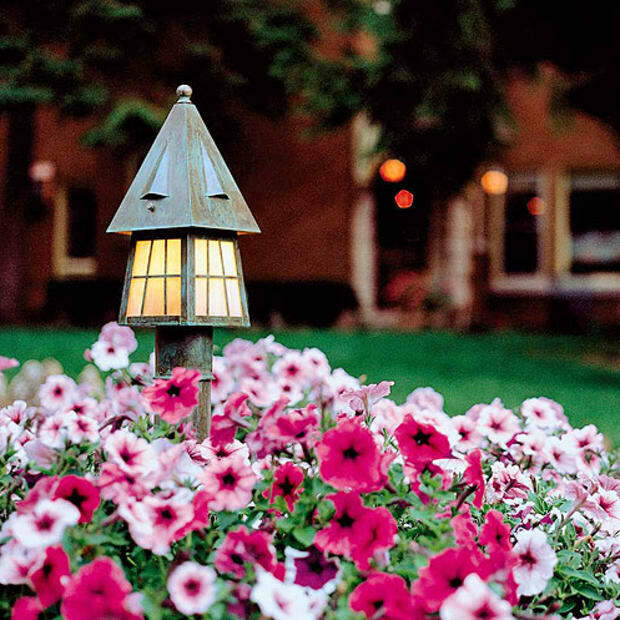 It offers the elegance of the late 19th century with the honesty of Arts & Crafts design.